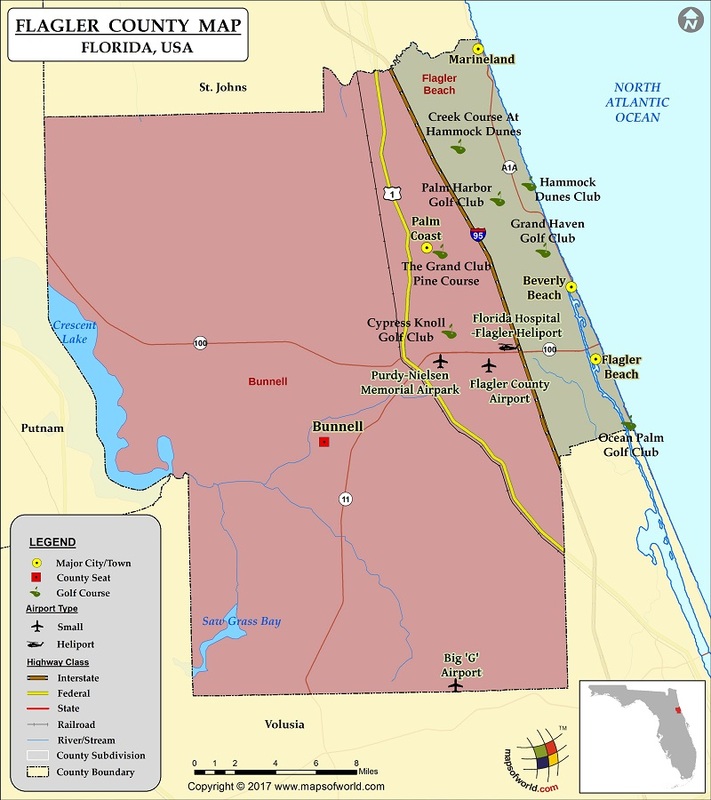 Flagler County is situated in the east coast of Florida. The county is spread over an area of 571 square miles. Of this, 485 square miles comprises land, while 85 square miles is water. As of 2010, Flagler County had a population of 95,696 people. Bunnell is Flagler's county seat. Named after the famed Henry Morrison Flagler, the founder of the Florida East Coast Railway, the county was formed in 1917 from parts of Volusia and Saint Johns Counties. Some of the counties adjacent to Flagler County include, St Johns County, Volusia County, and Putnam County. Interstate Highway 95 is an important route in Flagler County. Some prominent places of attractions in Flagler County include Belle Terre Park, Bird of Paradise Nature Reserve, Gamble Rogers Memorial State Recreation Area, Jungle Hut Park, Old Salt Park, among others.